Visiting angler Martin started his Thailand fishing holiday with a trip to Cha Am fishing park. On arrival at the lake Martin cast large balls of groundbait loaded onto sliding float set ups towards the many showing fish. The float had hardly settled before it was dragged under the surface and the first fish of the day was on. The angler played the Mekong Catfish for several minutes before it was ready for the net. 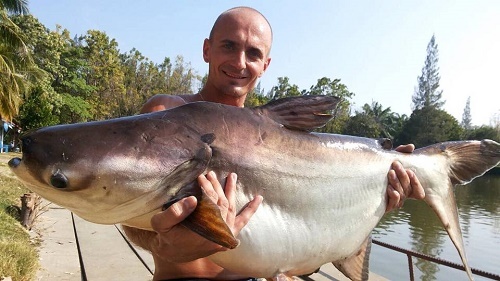 On landing the Mekong Catfish it was estimated to weigh 20kg and quickly released back into the lake. Further casts saw a repeat of the first take with the float burying itself under the surface before powering off across the pond. Action came thick and fast throughout the day with Striped Catfish and Mekong Catfish being landed on almost every cast. The Striped Catfish were particularly hungry with several double takes during the course of the days fishing. Martin fished with two friends and the group landed over one hundred catfish during their day fishing at Cha Am fishing park.